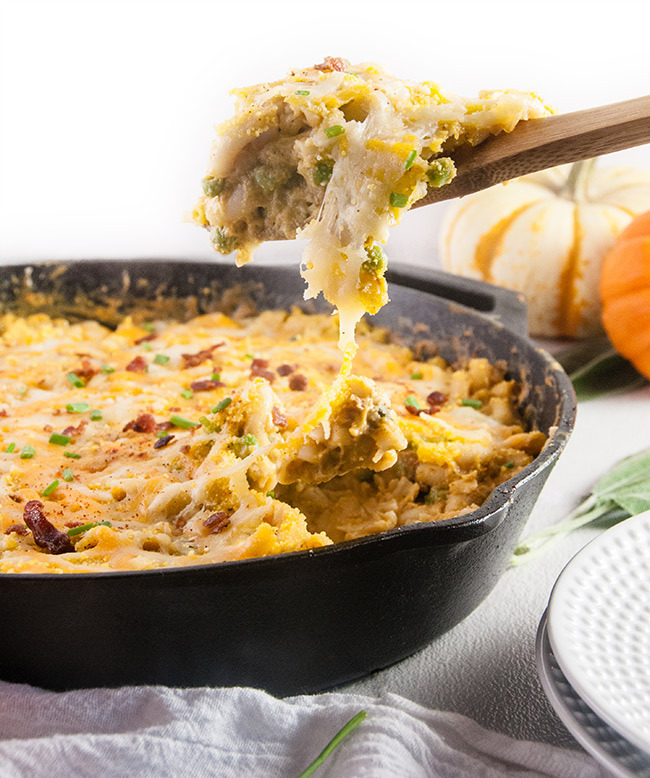 This pumpkin macaroni and cheese with pancetta and peas is a thing of beauty. Is it weird that I think food is beautiful? But… just look at it. So. Pretty. I just can’t even. Yes, I know, I know. But it’s that time of year you guys and I am embracing my basicness. I’m not ashamed. Not even one little bit. 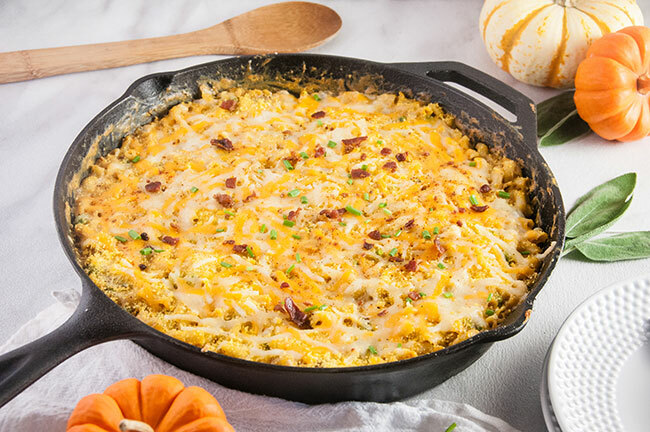 Because it leads me to things like this pumpkin mac n cheese, which might just be my new favorite thing ever. A lot of people don’t think of pumpkin as a savory thing, but it totally can be. I love the combo of pumpkin with parmesan. In fact, around this time last year, I was telling you guys about my Pumpkin Penne with Peas, Parmesan, and Sage. Also so good. 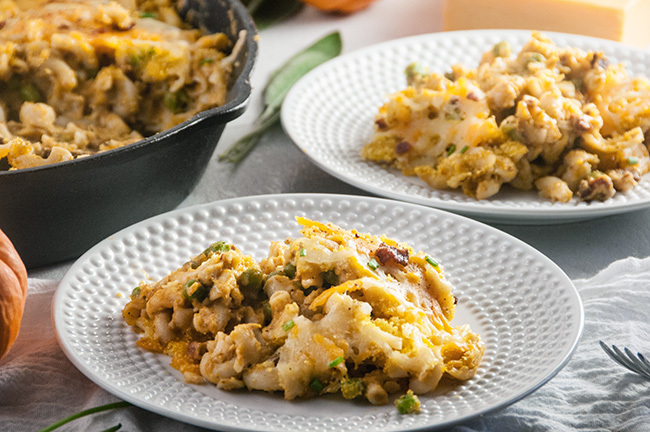 This pumpkin macaroni and cheese with pancetta and peas plays on all those flavors but it gives them that classic mac n cheese taste. But fancy. 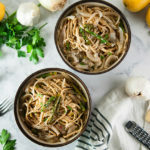 Like you could serve this as a date night dinner and make up some spiced apple cider sangria to go with it. Or you could serve it as a side on Thanksgiving. Totally. Because what is more Thanksgiving than pumpkin and a take on a side dish that Bob Evans sells, which FYI is my sister’s marker of whether or not food is Thanksgiving worthy. Anywho… this dish has all the flavors. A little sweet background from the pumpkin that just sort of blends into the background. 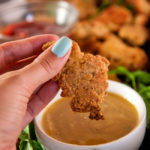 Little bites of sweet from the peas. A little bit of garlicky goodness. Some smokiness from smoked paprika. A little salty from the pancetta. And cheese, cheese, cheese. I used a mix of cheddar and gouda. Want to use something else? Go for it. Parmesan would be awesome. Gruyere? Oh yes. Aside from having all the flavors, this dish is light on cookware. Basically you need a pot to cook the pasta in and then a skillet. While the pasta cooks, you render the pancetta in the skillet. Drain some of the grease if you want. Add the pasta to the skillet and stir the other ingredients into the skillet. Keep stirring until the ingredients are well combined. Pop into the broiler. And bam. 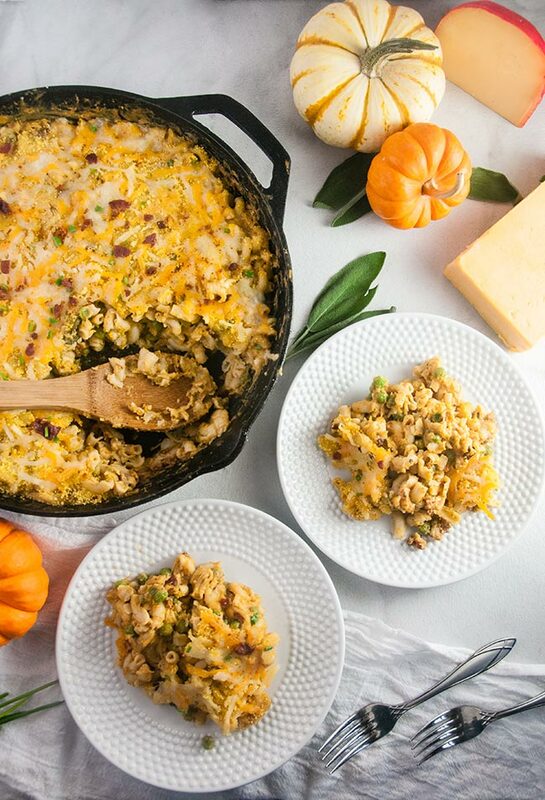 Pumpkin macaroni and cheese for all. 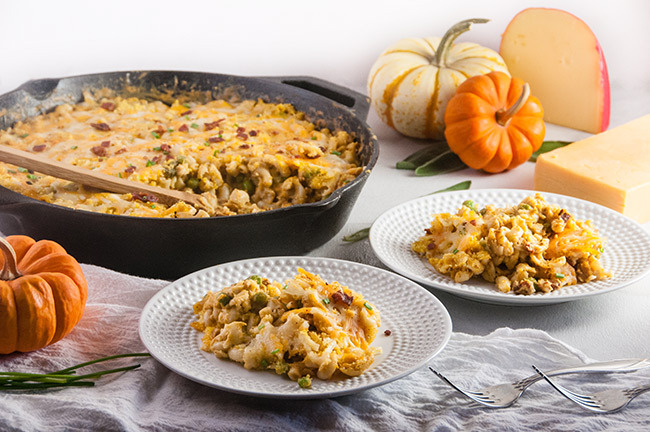 Delicious, savory pumpkin macaroni and cheese with pancetta and peas is the perfect main dish or would be a fabulous jazzed up side dish to serve on Thanksgivng. While pasta is cooking, heat a 12″ cast iron skillet over medium heat. Cook the pancetta until it is crispy. Discard some of the grease if you choose. Reduce heat to medium low. Add the pasta to the pan with the pancetta. Press 4 cloves of garlic in the pan. Stir in pumpkin puree, peas, milk, cheese and spices. Continue stirring until the cheese is melted and the sauce is combined thoroughly. Spread out in pan evenly. Sprinkle bread crumbs and additional cheese evenly over the top of the pasta. Drizzle on melted butter. Pop into broiler and broiler for about two minutes or until cheese topping is melted. Serve immediately and garnish with scallions or chives if desired. Enjoy! What beautiful images of a flavor-packed dish. 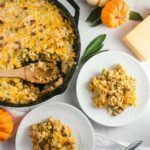 This Pumpkin Macaroni and Cheese is the perfect warm and cozy comfort food for the fall season! This looks wonderful! I usually only use pumpkin in desserts and breads. I’ll have to try this! I love anything pumpkin! This looks great I can’t wait to try it! This looks incredibly cheesy and delicious! 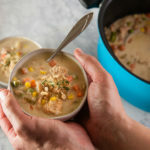 This is going on my list of recipes to make this month! 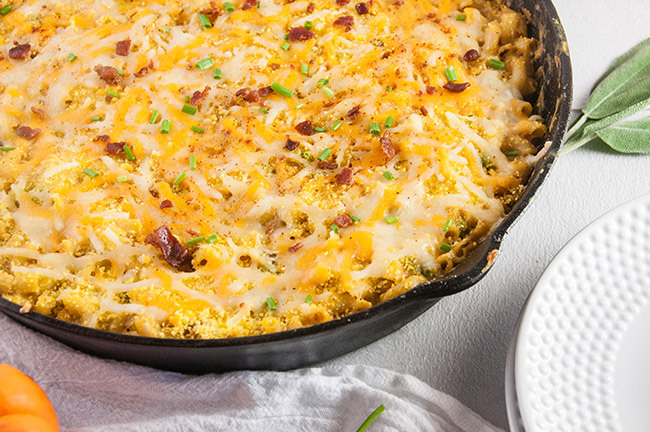 Gosh, this looks like the epitome of comfort food! YUM! This looks amazing! 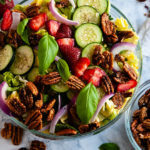 What a delicious and easy meal! That is a pretty-looking dish! It sound really interesting, and it’s one of those ingredient combos that I never would have thought of… but now I really want to try it! This sounds interesting and looks so good!! I’ll have to pin it to try later! Can’t wait to try this! Question – do I need to use whole milk or can I use lowfat? I used a mix of whole and half and half. I wouldn’t use low-fat in this.